Volvo S90 Running Costs, MPG, Economy, Reliability, Safety | What Car? The S90 range offers very competitive list prices and decent resale values, too. This is good news for private and company-car buyers alike, helping to keep PCP finance and leasing costs low. Company car tax isn’t among the cheapest in this class, thanks to slightly higher CO2 emissions than some of its rivals. Our True MPG testing also found that the D4 engine is a touch behind the class best for real-world economy, but in both areas the margins are small. With CO2 emissions of just 46g/km, the T8 falls into the lowest company car tax bracket and has official fuel economy figures of well over 100mpg. If you do plenty of short journeys punctuated by recharges, you’ll barely have to refuel it, because an average commute can be completed using mostly electric power. Use it without any electricity in its belly and you’ll see economy plummet to the low 30s or below. You do get a fantastic amount of standard equipment, though. Even the entry-level Momentum trim, which we think offers the best value for money, comes with loads of goodies such as LED headlights, heated leather seats, sat-nav, Bluetooth, and a DAB radio. It doesn’t stop there: a powered boot lid, keyless start and rear parking sensors are also included, as well as adaptive cruise control. Higher trims may add more luxury, but the price goes up accordingly. Volvo is synonymous with safety and it has taken things to a new level with the S90. The standard emergency city braking system doesn’t just brake if you’re about to rear-end a car; it also recognises large animals, pedestrians, and cyclists, too. All models get lane assist, which stops you veering out of your lane, as well as road-sign recognition that displays speed limits on the instrument display. 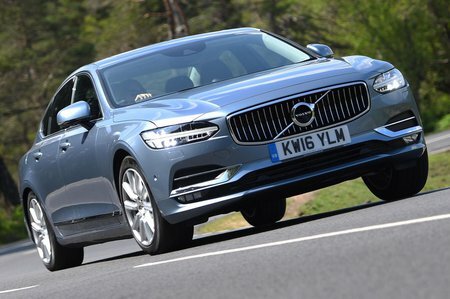 Accordingly to Euro NCAP, the S90 is one of the safest cars in its class, performing especially well in the safety assist category.